White volcanic rocks have been crafted by sea and wind. Nowadays, Plaka is the island’s capital and it is also one of the most intact capitals of Cyclades. Its name comes from the level ground upon which the houses of its first inhabitants were built, when the Castle (Kastro) could no longer house the entire population. Built on a hillock of 220m above sea level, with the use of island colors and according to the Cycladic architecture, with picturesque tiled alleys originally built for the protection against pirates, with small traditional shops, restaurants and cafeterias and with a magical view to the bay of Milos, Plaka composes a scenery of infinite beauty that you must visit and explore. (The circulation of cars is forbidden). On the hill top of Plaka lies the imposing Venetian “Castle” dated from the 13th century from where you can enjoy idyllic sunsets with beautiful colors and the panoramic view to the island’s bay, as well as to neighboring Cycladic islands. The Assumption of the Virgin or else “Mesa Panaghia” is the church to be found on the top of the Castle, whereas climbing up to the Castle and descending from it, you will find another exquisite church built on a black rock: The Ypapanti of Christ or Panaghia Thalassitra. Moreover, do not miss out to visit ‘’Panaghia Korfiatissa” which is the island’s cathedral from where you can enjoy a dreamy sunset right from its marble yard. Lastly, in the traditional settlement of Plaka, you will find most of the public services and the two museums that preserve the island’s cultural heritage, meaning its archaeological and folklore heritage. Pollonia or Apollonia is a picturesque fish village of 300 inhabitants, built around pretty creek on the northeast edge of the island. Pollonia is the island’s second port after the port of Adamantas. 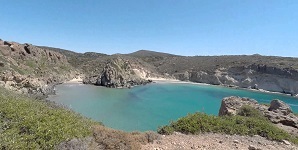 Possibly, it was named after the temple of Apollo that existed on the Lighthouse of Pelekouda (on the left side of the settlement). The distance from Athamantas is 10 kilometres, and from Plaka 14 kiliometres. 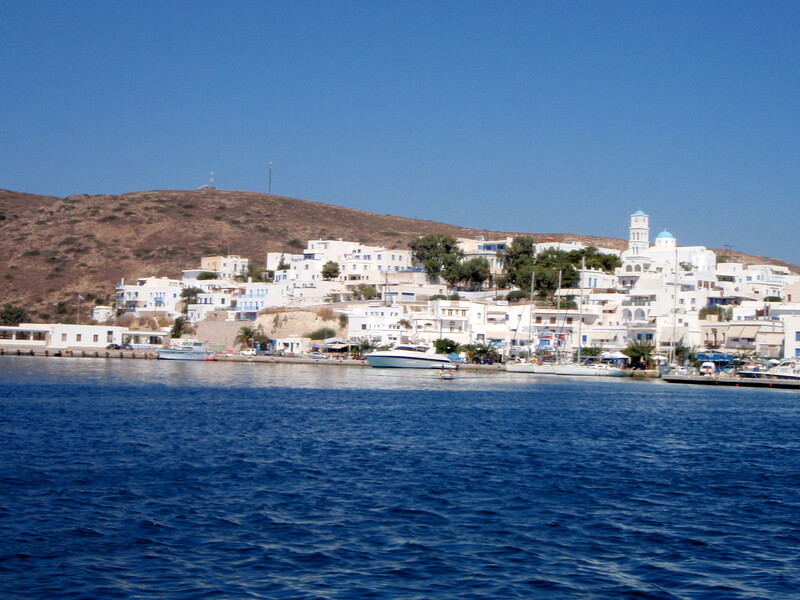 From there, there is transportation to Psathis which is the port of the neighboring island of Kimolos. Small boats, sea-taxis and ferry-boat transfer you from Pollonia to Kimolo within 30 minutes at the most. On the left side of Pollonia lies the chapel of Saint Nikolas and Pelekouda which is a picturesque peninsula worth visiting as according to the tradition, the couple that sits on the small rock shaped as a chair that exists there, will be together forever. 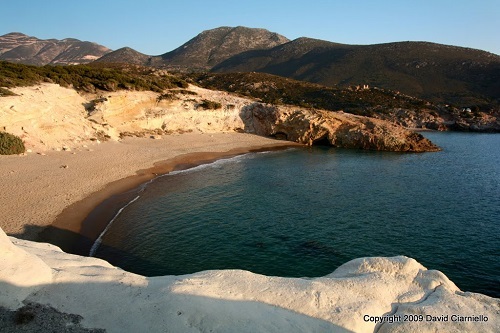 Finally, on the way to Pollonia, you will find the ruins of the ancient city of Fylakopi as well as the beaches of Mytakas, Agios Konstantinos, Papafragas and Kapros , while leaving the village heading south, you will reach Theioryheia(sulphur mines). 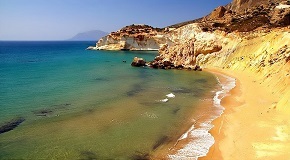 Milos is the 5th biggest island of the Cyclades and can be found at their southwest corner. When on the island I am 86 nautical miles away from Piraeus (138klm) and almost half way from Piraeus to Crete. If I were to walk around the island’s shores, that would mean traveling a distance of 125klm, and if I went up to its highest peak, at Profitis Ilias, I would be 751 meters above sea level. This volcanic island is reasonably hilly, with relatively low mountains and without much tree vegetation. The flora and fauna of Milos is quite rich with many rare species and as such, large parts of it belong to the Natura 2000 areas. 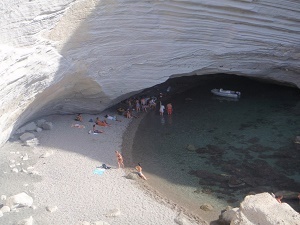 If I decided to stay permanently in Milos, then I would join 5000 fellow Melians. Adamantas is the central port, above which the island’s capital –Plaka– is located, circled in turn by the villages of Triovasalos, Pera Triovasalos and Trypiti. 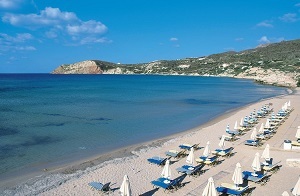 Another important township is Pollonia (or Appolonia), a seaside village and linking port to Kimolos. 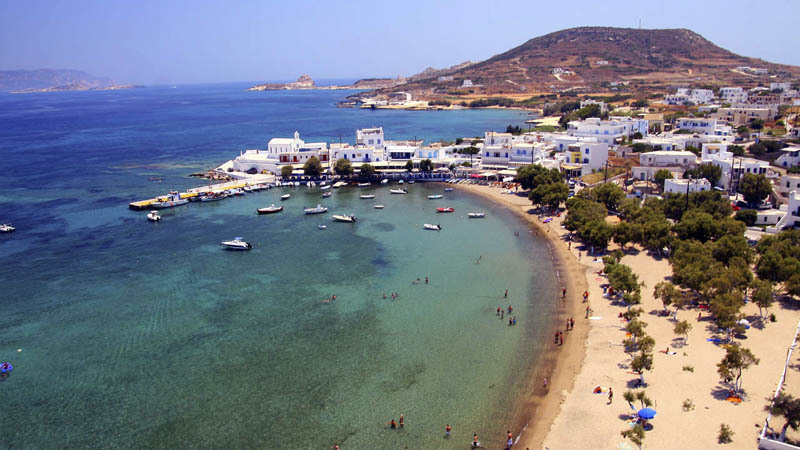 Other settlements include Zefyria, the old capital of the island built inland to be protected from pirates, and the coastal ones of picturesque Mantrakia, beautiful Fyropotamos and Klima, the “little Venice” of Milos. Milos has been inhabited for longer than 8000 years; an important part of the Cycladic civilization initially, it has attracted aspiring conquerors over the centuries due to its strategic geographic location and rich subsoil. The ancient town of Milos is located closer to the entrance of the harbor, built on the hillside between the villages of Tripiti and Klima. There lies the ancient Roman theater, ruins of the walls and other structures. Many important sculptures were discovered in these parts, including the Venus of Milo located in the Louvre, Asclepius taken to the British Museum, an archaic Apollo, which can be found in the National Archaeological Museum of Athens, and a great mosaic found during the excavations of the British Archeological School of Athens in 1896. 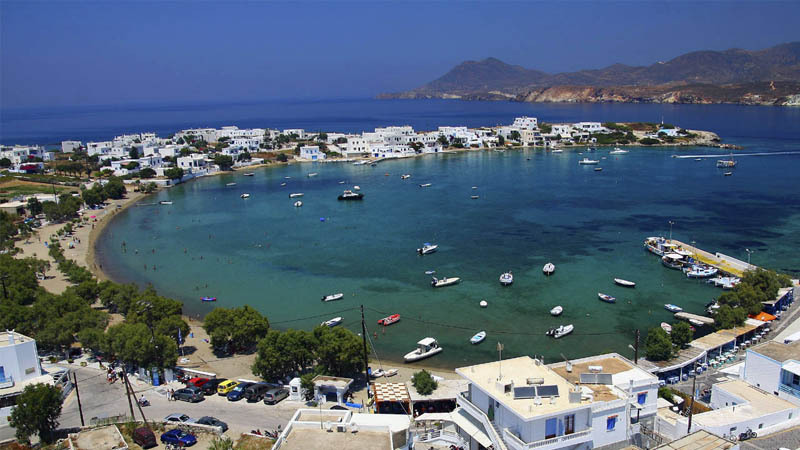 This modern seaside village is situated inside the bay of the island, which is one of the biggest and safest natural bays of the Mediterranean sea, and it constitutes the largest tourist center of Milos. Adamantas is its main port and the first view to look upon when approached by ship. Built on the north side of the bay, Adamantas or ‘’Alamanto” as it used to be called, has been inhabited since 1824. It was built by Cretan refugees expelled from Sfakia, who came to Milos after their failed and bloody revolution against the Turks. Nowadays, the village numbers around 1100 inhabitants. This seaside island town is composed of small snow-white houses with small yards decorated with flowers and narrow quite lanes which altogether compose a picture of excellent Cycladic beauty. The village of Adamantas throbs with life in summertime. In this village you can combine relaxation and calmness with night life and entertainment, whereas at the same time everything you need for comfortable and pleasant vacations is provided to you: [there are] cafes, restaurants, ouzeries, pizzerias, grill-houses, fast-foods serving souvlaki, a bar, a club, shopping centers, supermarkets, banks, the port authority, the customs, a health center, a pharmacy, a dental clinic, a newsstand for Greek and international press, etc. Here, the island’s night life is intense with bars playing various kinds of music that speed up the rhythms and the entertainment tempo till the very break of dawn. On the port’s left side you can find the parking lot and then the Lagkada quarter with the Lagkada beach, whereas on the port’s right side the main coastal road stretches out leading to the village’s central square where the bus stop lies, and the taxis await you. On the one side of this coastal road, there is a long tiled pavement, cafeterias, restaurants and tourist shops as well as the municipal Hot Springs of Lakkos, whereas on its left side stand the relatively new port facilities which combined with the safety of the natural port, make Adamantas suitable for yachting activities. 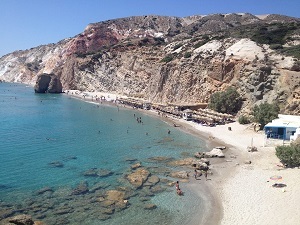 (From that point also the trips with boats and touring yachts set out reaching for the inaccessible beaches of the island and also for the tour around Milos and Kimolos). If you desire to swim, Adamantas can offer that to you, too. Within a short distance and accessible without the use of any means of transportation, lie the beaches of Lagkada (500m from the center of Adamantas) and the beaches of Papikinos (1km away from Adamantas). Finally, the sights of Adamantas include also : the church of The Assumption of the Virgin, the catholic church of Saint Nikolaos, the Mineral Museum and the Church Museum where the one thousand year old church of The Holy Trinity is housed. The calendar leafs may have otherwise been turned to autumn, but September is still a summer month in Milos, though pointing toward its end. The sea is warmer than any other period of the year and the weather is my “friend” in any excursion I plan, since the trade winds are long gone. On the other hand, summer temperatures are still here and remind me that summer in Greece is more than August. All the stores on the island are still open and prices for lodging are as low as at the beginning of summer. On the 31st I get the chance to see the Bonfires of “Old man August”, a traditional custom that takes place particularly in Tripiti and Pollonia. Locals light big fires just before sunset and jump over the flames, in order to gain strength to face the cold of the coming winter. Moreover, one of the most important events of the island starts on the 16th of September each year. It is the three-day fair at the monastery of St. John Siderianos in Halakas. This religious festival is the largest in Milos and many visitors come just for that. 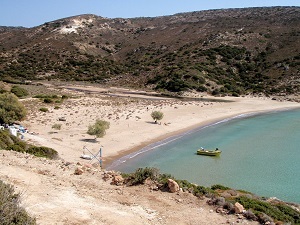 Indicative is the fact that many residents of the neighboring island of Kimolos, vow to make the hike to Saint John on foot after setting foot off the boat that connects Kimolos to Pollonia, a distance of 30km from the port to the monastery! By now summer is at its height, the weather is quite warm, and the only thing I can think about is the beach. 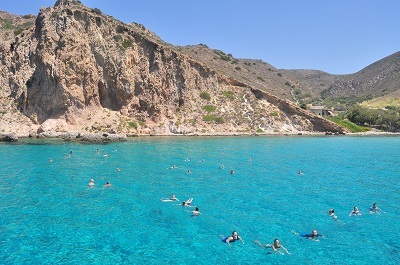 Ι can enjoy the crystal waters of the Aegean in one of the island’s beaches, along with numerous other visitors who have come to Milos from around the world. Tourist traffic has surely risen and culminates in August. If I intend to visit the island during this popular month, I will need to have secured my accommodation and tickets already, so as to avoid the hassle and waste of time. The summer trade winds have picked up and are blowing in often now, adding to the characteristic identity of the Cyclades cooling me down and. Fortunately the island has many leeward beach options if the northerly winds happen to become a little more intense. 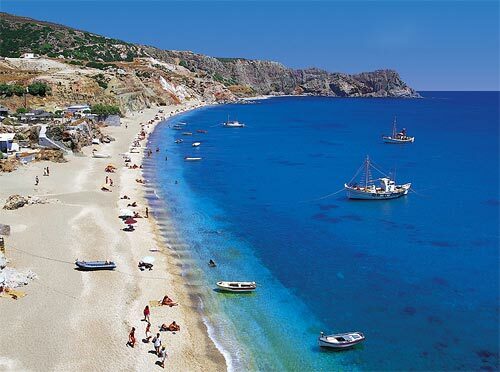 In the middle of the summer people spend their day on the beaches, in shops and at the local tavernas (restaurants). The evening calls for me to enjoy the nightlife, from “quiet” beach bars under the starry sky, to clubs where I can dance until dawn and everything in between. During the summer my options are expanded with the cultural festival of Milos, which invites known and established artists, but also the various local festivals. In these I shall be able to taste local dishes and good wine, while the locals will invite me to dance with them to traditional Greek songs.